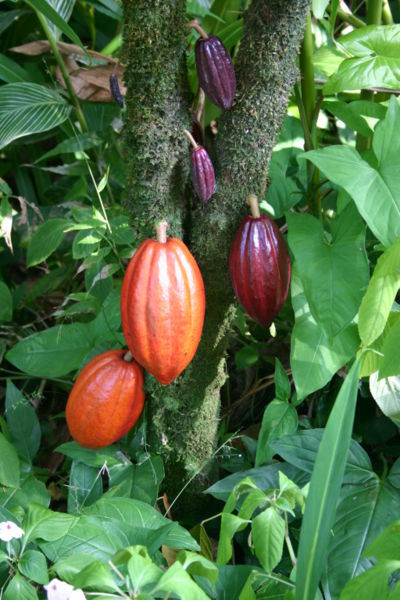 The cacao tree is a tropical evergreen plant and was christened Theobroma Cacao during the eighteenth century by the Swedish botanist, Linnaeus. Theobroma Cacao means ‘the food of the gods’ from the Greek ‘theos’ meaning ‘god’ and ‘broma’ meaning ‘food’, reflecting the reverence chocolate has. The tree bears fruit in the form of bright red, green, purple or yellow pods, which change colour as they ripen. The pods are harvested from May to December and are cut using long-handled, curved steel knives, because the trees are too frail to climb. Each individual chocolate offers its own distinctive flavours, textures and aromas, allowing an appreciation of the wealth of variety that can be created from the fruits of the Cacao tree. As with wine tasting, there are a few simple steps to truly savouring fine quality chocolate. Chocolate should always be stored in a cool, dry and odour-free environment, but not in the fridge. Allow it to reach room temperature (18-20*C) before tasting. Begin with white chocolate, followed by the milk varieties, and move onto the stronger flavours of dark chocolate. Before you begin, sip a little water or limejuice to cleanse the palate. And repeat after every tasting. Look at the surface of the chocolate. It should be smooth and glossy. Snap off the chocolate. It should make a clean, crisp snap. Place a piece of the chocolate in your mouth and wait a few seconds. This will allow you to taste the immediate flavours and aromas. Notice the feel of it on your tongue (called ‘mouth feel’) - it should feel firm and melt ‘cleanly’, without a waxy, sticky or grainy texture. Chew the chocolate to expand the surface area and release the second level of flavours and aromas. By rolling the chocolate around the tongue you will experience the full range of flavours by triggering the four taste zones - sweet and salty (tip of the tongue), sour (sides) and bitter (back). Wine is easily overpowered by chocolate, so it is important the wine has a strong single-note aroma, to withstand the strength of the chocolate flavour. Port and dessert wines (such as Marsala or Muscat) work well. For red-wine lovers, cabernets are a good alternative; they contain a hint of cocoa, as well as spices, but avoid the more oaky ones, as they will inhibit the flavour of the chocolate. Fruit wine also works well with dark chocolate. Rum can work well with ganaches and pralines, while cognac and Armagnac suit dark chocolate or centres that are not sweet. The three main varieties of cacao beans used in chocolate are Criollo, Forastero and Trinitario.Criollo, the variety native to Central America, the Caribbean islands and the northern tier of South American states, is the rarest and most expensive cocoa on the market. The flavour of Criollo is characterized as delicate but complex, low in classic chocolate flavour, but rich in “secondary” notes of long duration. Forastero is a large group of wild and cultivated cacaos, probably native to the Amazon basin. The huge African cocoa crop is entirely of the Forastero variety. They are significantly hardier and of higher yield than Criollo. Forastero cocoas are typically big in classic “chocolate” flavour, but this is of short duration and is unsupported by secondary flavours. There are exceptional Forasteros, such as the “Nacional” or “Arriba” variety, which can possess great complexity.Trinitario, a natural hybrid of Criollo and Forastero, originated in Trinidad after an introduction of (Amelonado) Forastero to the local Criollo crop. These cocoas exhibit a wide range of flavour profiles according to the genetic heritage of each tree.Nearly all cacao produced over the past five decades is of the Forastero or lower-grade Trinitario varieties. The share of higher quality Criollos and Trinitarios (so-called flavour cacao) is just under 5% per annum. Different manufacturers develop their own “signature” blends based on the above formulas but varying proportions of the different constituents are used. Chocolate is very sensitive to temperature and humidity. Ideal storage temperatures are between 15 and 17 degrees Celsius (59 to 63 degrees Fahrenheit), with a relative humidity of less than 50%. Chocolate should be stored away from other foods as it can absorb different aromas. Ideally, chocolates are packed or wrapped, and placed in proper storage with the correct humidity and temperature. Additionally chocolate should be stored in a dark place or protected from light by wrapping paper. Sunlight may warm up the surface of the chocolate and cause it to turn ‘grey’ from the formation of cocoa butter crystals; the taste may be slightly different due to the altered cocoa butter.